At the NIU College of Education, we know what’s important to us – and we know what’s important to you. You want a college experience focused on your success through innovation, collaboration and inclusion. You want hands-on experience in the field. You want professors who apply their cutting-edge research to their classroom teaching. We’re with you. We value those things, too. 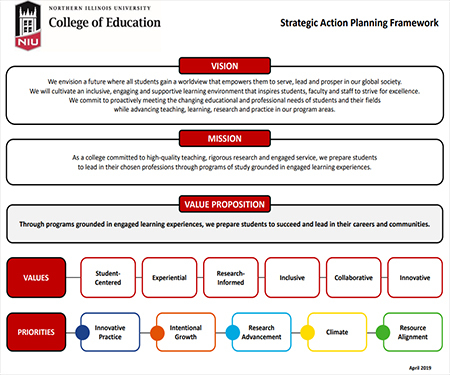 Our Strategic Action Planning framework, unveiled in January of 2017, demonstrates our commitment to your future and ours. We nurture the growth of our students as well as our faculty and staff as we build on a shared identity with common goals and priorities. Moving forward, our leadership team will review the framework annually to make sure this “living” document continues to reflect and reinforce our values while addressing new challenges and opportunities.